This week’s Raw spent a lot of time putting the finishing touches to stories heading into this Sunday’s SummerSlam, with CM Punk vs. Brock Lesnar and John Cena vs. Daniel Bryan having their last opportunities at the big sell before the Biggest Party of the Summer. Whilst it’s likely that Christian vs. Alberto Del Rio, Cody Rhodes vs. Damien Sandow, Kane vs. Bray Wyatt and Dolph Ziggler & Kaitlyn vs. Big E Langston & AJ Lee, will probably have one last shot on Smackdown, this was also their last opportunity in front of television audience of this size. On the whole, WWE did a solid job of the show, helping to make the SummerSlam card look positively stacked. With this match being given the main event spot on the show, there were a couple of backstage segments used to build towards it. Firstly, Josh Matthews interviewed CM Punk backstage, and as we’ve come to expect from CM Punk he delivered a solid interview, outlining how he wasn’t expecting a fair fight out of Paul Heyman, as well as talking about his contest with Brock Lesnar at SummerSlam. Punk set up the idea that Heyman saw this all as one big chess game, a point that would be capitalised upon later on. It’s nice to see WWE dropping hints that are little more subtle than what they did with Team Rhodes Scholars at Money in the Bank! The WWE cameras were also on hand to show us a moment backstage between Paul Heyman and Intercontinental Champion Curtis Axel, where it seemed Heyman was having second thoughts about the match. Whilst Axel’s acting ability was questionable, it at least made it seem like Heyman was serious about having the match with Punk. Of course, Heyman wasn’t serious about having a one on one match with Punk, and in the final segment of the show, the mad scientist revealed his true intentions, in another stunning promo. Heyman’s sentiments are similar to a crazed ex-girlfriend, accusing the WWE fans of taking CM Punk away from him, and if it wasn’t so well delivered it would be comical. Heyman admitted the match was a trap for Punk, bringing out Brock Lesnar and making the bout two-on-one. Heyman baited Punk even more by saying he didn’t have to play the hero, he could instead disappoint the fans. Of course, Punk’s music hit and it looked like SummerSlam might come early once again…. Everything about what I was seeing on my television screen at this point gave the game away. The angle of the camera, the position of Heyman and Lesnar, the amount of time Punk’s music player for, and I was correct. Punk slid into the ring from behind Lesnar and Heyman, but it was what happened next that shocked me. Punk grabbed the television camera out of it’s operators hands, delivering a number of vicious shots to Lesnar, before grabbing a steel chair and continuing the beating. Like much of this rivalry, the beating looked legitimately painful, and if it wasn’t Lesnar did a great job of selling it as such. With Lesnar down, Punk would turn his attention to Heyman, chasing him up the entrance way. With Punk gaining on Heyman, Curtis Axel would make the save for his manager allowing him to escape. It wasn’t long before Punk gained the upperhand, delivering a GTS on the stage. As Punk finished the show with the words “I am the Best in the World!” it was clear Heyman’s trap had backfired in another piece of strong storytelling for this feud. Many could argue that CM Punk has already gotten the best of Brock Lesnar after weeks of coming up short, so the SummerSlam contest is now redundant. However, for me, Punk getting the best of Lesnar has never been the focal point of this story. For me, the focal point has been Heyman’s betray of CM Punk, and Punk’s attempts to get his hands on his former best friend. Now we know that Punk is clever enough to defeat Brock Lesnar, at least when armed with camera, but can he beat in a straight up fight, and we haven’t see him get his hand on Heyman. That’s what the promise of SummerSlam is for me, buy SummerSlam to see if CM Punk can defeat Brock Lesnar and get his hands on Paul Heyman! Before Miz TV later in the night, Daniel Bryan and Wade Barrett had a rematch of their bout from the previous week’s Smackdown, with Raw General Manager Brad Maddox inserting himself as special guest referee. The majority of the match was pretty similar to the two bouts the pair have had on Smackdown recently, with Barrett in control, until Bryan launched into a comeback. Except this time, as Bryan launched into his regular “Yes” kicks spot, Barrett managed to duck a kick and pull off a school boy roll up, with Brad Maddox counting a quick three count to give Barrett a pinfall victory. It seemed a bizarre decision to have Barrett go over, just to further Maddox’s alignment with Mr. McMahon, in a story that’s already been over crowded, but would, sort of, pay off later on in the show. Later on in the evening the plot thickened, with WWE Chairman Vince McMahon calling out Brad Maddox on his fast count during the Bryan/Barrett match. After some explanation, Vince was quick to forgive Maddox, before the Raw General Manager asked to officiate the SummerSlam main event. Now, I’m a fan of Brad Maddox, but at this point I was about to throw my television out of the window, because I’ve said before John Cena vs. Daniel Bryan does not need any bells and whistles to sell the match. Therefore, for the first time in a good few years, I was legitimately relieved when the opening stings of Motorhead’s “The Game” began to play and WWE COO Triple H made his way to the ring. Unfortunately, Triple H was only there to make himself the special guest referee, before hitting Maddox with a Pedigree. Whilst having Triple H as special guest referee is marginally better than having Brad Maddox, I’d still rather see this match without shenanigans. Whilst everything going on around them seems intent on destroying their match at SummerSlam, John Cena and Daniel Bryan were about to bring everything back around, as they joined The Miz for Miz TV. After getting the opening questions out of the way, and The Miz being his usual annoying self, and ending up being told to stay quiet by Daniel Bryan, we launched into two of the strongest promos, of Bryan and Cena’s respective careers. Firstly, Bryan went after Cena for being more style than substance and referring to him as a “parody of wrestling”, it worked so well for me because it’s true. John Cena’s character is a parody, it’s a parody of Hulk Hogan from the 1980’s. I have the upmost respect for John and he has put on some of the best matches on WWE television over the last few years, but there is no escaping the similarities between his act and Hulk Hogan’s. John Cena’s reply then was just as good, as Cena seemed to pulling on real emotion for the first time in a long, we’ve seen him bat of the fans criticism, but it affected him here for the first time, and it’s much easier to empathise with someone who appear human, rather than the Superhero image that Cena usually brings to the table. Most of all though, Cena was taking this seriously, no silly jokes, no unfunny puns, just one man defending his honour, it sounds simple but it works! Then it got even more serious, with Daniel Bryan claiming that Cena doesn’t take him as seriously as previous opponents like Shawn Michaels and The Rock, with Cena saying Bryan was right, announcing he won’t respect Bryan until he has won the WWE Championship. This really riled Bryan up, who talked about a Japanese culture where opponents would slap each other in the face before their matches, before saying he wouldn’t be doing so for Cena, because he is not a wrestler. It was delivered perfectly and really worked the Anti-Cena faction well. Cena had had enough, and slapped Bryan square in the face, but before we could see Bryan respond, Mr. Spotlight Stealer himself Triple H turned up to stand in the middle of the ring, with Randy Orton holding his Money in the Bank briefcase a loft on the entrance. I’ve defended Triple H before, but there really is no other reason for him to be involved in this bout, other than to massage his massive ego. The Randy Orton thing is starting to become a little too obvious, and if it does happen on Sunday would have been much better if WWE didn’t decide to sign post it here, with big flashing lights! After a string of disappointing results for World Heavyweight Champion Alberto Del Rio, against the likes of Randy Orton, Rob Van Dam and his SummerSlam opponent Christian, it was vital that Del Rio got back to winning ways on Raw, to at least attempt to salvage his dire run as World Heavyweight Champion. Now, that isn’t to say his matches haven’t been quality television bouts, because they have, but losing so many matches in the past month have made him look like a paper champion. I was therefore a little confused as to why WWE had chosen Kofi Kingston as his opponent. Yes, Kofi is capable of making his opponent look very good and as we’ve seen in the past able to have quality matches with Del Rio, but bringing him into a match like this just one week after he returned to television, showed me that WWE clearly have nothing for Kingston at the moment, and they aren’t planning on pushing him anytime soon. The contest was a strong television match, that went for about six minutes of air time. Kofi spent most of the match frustrating Del Rio with his pace, and whilst Del Rio would temporarily regain control, it didn’t last long with Kofi moving out of the way of Del Rio’s signature Leapfrog Body Guillotine, sending Del Rio crashing to the outside. One thing I did notice during Del Rio’s brief spell in charge, was the way Del Rio worked the crowd, taunting them and Kingston, it was simple but effective because the character is so unlikeable. With Kingston seemingly back in control of the bout, hitting the Boom Drop, before beginning the set up for Trouble in Paradise, Del Rio ducked and it was the beginning of the end for Kingston. Following an exciting close section, including another missed Trouble in Paradise and near fall via roll up for Kofi, Del Rio managed to lock in the Cross Arm Breaker. Kofi spent a long time in the hold, selling it well as he reached for the rope, but it was too far for Kingston who ended up taping out, giving Del Rio the submission victory. It was an enjoyable finish that suited a quick and pacy match that benefitted from not sticking to usual WWE format. Personally, I think both Del Rio and Kingston suit their roles well, and that came across well in this bout. The bout allowed Del Rio to at least gain a shred of credibility that he has lost over the past month, which is shame after WWE did such good work with him during his feud with Dolph Ziggler. Will Kingston be getting anything more substantial with WWE anytime soon, I doubt it. Later on in the night, WWE showed a vignette highlighting the career of Christian as he prepares for his title match with Del Rio at SummerSlam. As usual WWE did a very good job of the vignette, and it really made Christian look like a top contender for the championship, but it did feel a bit desperate on WWE’s part, who must know they’ve done a pretty poor job of promoting this bout up until now. With Renee Young interviewing Christian straight after the vignette, Young may have stumbled over her words, but Christian didn’t, as he delivered a sound face interview, quickly skimming over his injuries (take note Chris Sabin) before claiming this was the “One More Match” he’d been asking for. With Del Rio interrupting saying something in Spanish (he’s heel now), to which all I could make out was “Une Match Mas”. It was a little too late for their match at SummerSlam, had this been done three or four weeks ago, we might have had the makings of interesting feud but as it stand Christian vs. Del Rio stands out like a sore thumb on the SummerSlam card. Elsewhere, the two Money in the Bank winners Randy Orton and Damien Sandow faced off in a rematch from the 26th July episode of Smackdown. It was one of the longer matches of the longer matches on the show, and I’m not quite sure why. Similar to their match on Smackdown, the pair, for the most part, both men simply went through the motion with nothing particularly grasping my attention for most of the match. The only interesting spot saw Orton attempt his signature powerslam, only for Sandow to hold onto the ropes and reverse into a nice spinning neckbreaker for a near fall. The end saw the involvement of Sandow’s rival Cody Rhodes, who was on commentary, as he went to take Sandow’s Money in the Bank briefcase, which was handcuffed to the ring post, thus causing the distraction for Sandow and allowing Orton to hit an RKO and pick up the pinfall victory. It was a solid finish that gave the rivalry that extra layer heading into SummerSlam, but I’m not sure we needed a whole ten minutes of build up to get to that point, in what was a pretty dull match. With Orton only turning up when it pleases him, hopefully he’ll turn up for the entirety of his impending WWE Championship, or else it won’t be a very long one for the former Legend Killer. There was also a twenty man battle royal with an opportunity to face The Shield’s Dean Ambrose at SummerSlam Kick-Off for the United States Championship awaiting the winner. Before the match, The Shield delivered a promo backstage, surprisingly the bulk of the promo was delivered by Tag Team Champion Seth Rollins. We’ve only really seen Rollins play a bit part in these sort of segment before, playing second fiddle to Ambrose. Rollins handled himself very well, delivering his strongest performance in WWE to date, as he ran down some of WWE’s older talent, and building up his group as the future of WWE. This would become even more resonant come the conclusion of the battle royal. Now, it has to be said that I love a good battle royal! When done correctly it can do wonders for numerous talent at the same time and be a pleasure to watch. Luckily that was the case here, as the match built up really well. 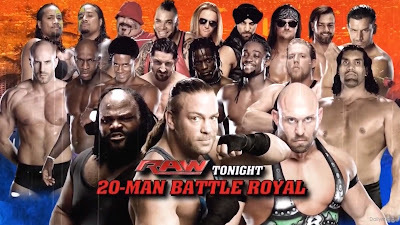 After a few eliminations from Ryback, it took a while for the bout to get going until R-Truth eliminated Fandango, and in a classic battle royal spot, Fandango re-entered the match to eliminate R-Truth. With the break cleverly being used to thin the field with a number of superstars exiting on the WWE App. Then followed some of the best work of the match between Kofi Kingston and The Real Americans, with Kofi eventually being eliminated. With Henry eliminating The Real Americans and Barrett, and RVD and Henry working together to eliminate Ryback we were down to our final two. It seemed Henry would be the likely winner due to his recent feud with The Shield, however it was RVD who came out victorious after he sent a charging Henry over the top rope. With barely enough time to celebrate, The Shield headed down to ringside with Henry and RVD standing back to back. It was here that the Big Show returned, charging to the ring, with The Shield retreated. I suspect Henry and Big Show will team up on Sunday against Rollins and Reigns, which could be an interesting battle, but Big Show’s return would have been more impactful had WWE not advertised it three weeks ago! Kane was also in action on Raw as he faced Titus O’Neil of the Prime Time Players. It was ensentially a squash match as Kane dominated throughout, even a distraction from Darren Young couldn’t stop Kane delivering a Chokeslam to pick up a pinfall victory. This bout was essentially to show what Kane can do against bigger opponents, after he destroyed 3MB on Smackdown, as he heads into a SummerSlam bout with Bray Wyatt. Talking of Wyatt, he and his family came out with their usually entrance after the match, but when the lights went up, Erick Rowan and Luke Harper were alone in the ring, with Kane standing up on the entrance ramp. It was a nice reminder that Kane can play mind games too, and whilst Bray didn’t look particularly phased when Kane trigger his usual pyro, it was still good to see Kane looking strong heading into the pay per view. In a bizarre mixed tag team match Divas Champion AJ Lee teamed with Big E Langston, to take on Natalya and The Great Khali, who were accompanied by Hornswoggle. AJ and Natalya wrestled the entire match, which for the most part was fairly enjoyable as their previous one-on-one contests have been. There was some nice work with AJ and Hornswoggle, which fans of NXT Redemption would have enjoyed, leading to Natalya locking on the Sharpshooter on AJ. It was here that the match got weird, with the referee deciding not to call a clear submission from AJ, which lead to confusion from the Divas in the ring, who had to quickly improvise a situation with Natalya locking in the Sharpshooter again to finally get the victory. With Langston walking into a chop from Khali to close the segment I was left very confused. Is it Khali and Natalya booked to face Dolph Ziggler and Kaitlyn at SummerSlam? Has Natalya got a Divas Championship match for beating the champion two matches in row? Both the answers are no… so why are Khali and Natalya going over here? I have no idea. Natalya was also involved later on in the night, as Josh Matthews interviewed The Bella Twins and Eva Marie. It was another poor segment for the Total Divas girls, with Natalya’s personality barely helping to rescue the segment. After a match had been set for SummerSlam between Natalya and Brie Bella, with the Funkadactyls in Natalya’s corner and Nikki Bella and Eva Maria in Brie’s corner, Natalya continued to wind up Brie about last week’s slap, Brie replied with a slap of her own to close the segment. Whilst I’m happy that Natalya is getting some time on television, and heading for a pay-per-view contest, I’m not quite sure why this feud warrants a pay-per-view match, and why Dean Ambrose vs. Rob Van Dam is pushed to the Kick Off show. In the rubber match of their series, The Usos took on Zeb Colter’s Real Americans in another solid tag team outing from these two teams. With The Real Americans grounding Jey Uso with some good submission holds and double team attacks, the highlight for me being Jack Swagger launching Jey into an upper cut from Antonio Cesaro for a near fall. The Real Americans even threw in a well worked blind tag spot, when Jey looked to be making a comeback. With Jey eventually making the hot tag to Brother Jimmy, things looked bleak for Swagger as he took a running hip attack form for near fall with Cesaro pulling him out of the ring for the save. The finish of the match was equally impressive, with Jimmy heading to the top to hit a Superfly Splash on Swagger, Colter caused the distraction to allow Cesaro to attempt to push Jimmy from the top rope, only to receive a Superkick from Jey, who made the blind tag to score a roll up victory on Swagger. It made sense for WWE to give the face team the victory here, as the Tag Team Champions The Shield are heel, will The Usos get another shot at the gold, time will tell. In a random segment that summed up WWE’s current influx of dancing gimmicks, with Fandango and R-Truth supposedly having a match, an impromptu dance off ensued with each man showing off his respective skills, until it broke into a fight with R-Truth eventually getting the upperhand. With Fandango reminding people how to say his name the segment came to an end. I have no idea what was trying to be achieved here, or why the two could simply have just had a wrestling match. Fandango’s push seems well and truly over, with WWE seemingly going sour on the Ballroom dancer, I can’t imagine a feud with R-Truth will help him much either. What did I learn from this week's Raw? 1. Brock Lesnar vs. CM Punk is the strongest booked match heading into SummerSlam. 2. That honour could have gone to John Cena vs. Daniel Bryan, had Cena and Bryan been left alone. 3. Unless some minor miracle happens on Smackdown, Alberto Del Rio vs. Christian has been the poorest booked, yes, even worse than Brie Bella vs. Natalya.